I hope you get a lot of grapes on your grapevine. 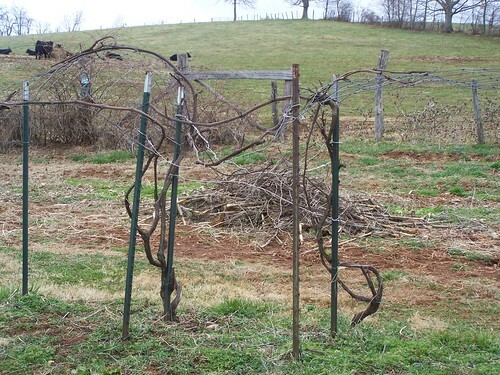 We need to take care of our old grape vine and we got a seedless concord grapevine over the weekend. I will have to get some tips from you. I can’t wait to see your surprise! Hubby said he couldn’t understand why they moved the town across the creek when they first did it. I know that most of those buildings were very old. I also remember him telling me about a flood in that area in the 70’s? that about wiped out the town of Grundy. Are they finished with the Wal Mart yet? Richard (Hubby) told me that the community was excited upon hearing about a Wal Mart being built. I think the nearest one is in Richlands area. My husbands name is Richard (Kenny) Mullins. I call him Richard everyone in W.VA. calls him Kenny. He moved away when he was 19 (now 45) to go to a vocational school here in NC. That is how we met. It’s so cool to hear from someone that lives up his families’ way. Have a blessed weekenin in THE LORD! hI.. LOVE YOUR GRAPEVINES. WHAT IS A STEAM JUICER? SOUNDS LIKE SOMETHING I WOULD LIKE TO TRY. We do like the grape juice from our vines, and the steamer/juicer certainly makes it easier to do. I have made tomato juice with it as well. Cook the tomatoes enough to make them soft and then run through the Victorio Strainer. We have wind here as well. A little too cold to be outside without a heavy jacket and a beanie on your head. I am looking foward to seeing the picture of them all covered with grapes! I am going to look up steam juicer! We had a nice weather day. I sure needed it! How wonderful to have grapes! Looking forward to seeing your “surprise”!